Look what we found while Spring cleaning! 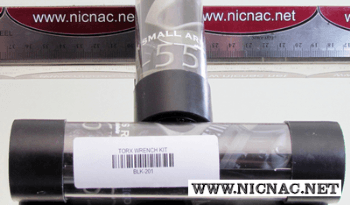 This is Microtech Knives Original BLK-201 Torx Wrench Tool Set manufactured by Microtech. The bits and handle are all steel and comes in the original packaging. These are sold only to adjust your screws. Disassebling your Microtech knife will void the warranty. Don't try to tighten the screws too tight! Bits are magnetic.